In “Field of Dreams,” Kevin Costner’s character, Ray, sees a vision of a baseball diamond in his cornfield and hears a voice telling him to build a baseball field there, which Ray does. People close to Ray tell him he’s crazy—that he’s going to go bankrupt if he doesn’t replant his corn. But Ray’s not the only one who believes—his faithful daughter reassures everyone that people will eventually come to watch baseball at the field. And she’s right. By the end of the movie, baseball dreams have been fulfilled, Ray “reunites” with his father, and cars are pulling up outside the diamond—all because Ray believed in dreams and what his heart was telling him. I love that movie. It celebrates the same values we have at Ralph’s Hardwoods—family, tradition, staying true to yourself, and working hard to fulfill dreams. I also know how Ray felt when people questioned his sanity. When it was time in 2005 for Ralph’s to build a new facility, a lot of people thought we were crazy when we decided to build it in Black Creek, rather than take the opportunity to move to a more-urban area. We could see the advantages of being in a city like Green Bay or Appleton. It would make it easier for more customers to visit our showroom, cut down on our transportation costs and time, and give us access to a bigger labor market. But our dream wasn’t to build a great new showroom in a city. We dreamed of building a great facility—and continuing to build a great company—in the community that’s been home to us since my Dad founded Ralph’s Hardwoods in 1965. We can’t think of any better place to be than Black Creek. We feel like a part of the community, and that the community is part of us. We are very pleased and proud to be the second largest employer in town. And the lure of a larger labor pool in a city really wasn’t the strong for us. We are more than happy with our team members from the Black Creek area—they are loyal and smart, with a solid farm work ethic. We consider our employees to be a key advantage over our competition—and we didn’t think it was too wise to give that up. 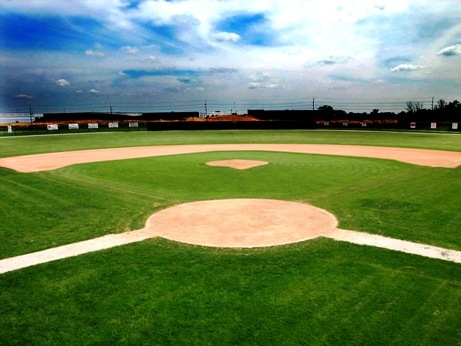 Just like people eventually came to Ray’s field, our customers have come to the dream showroom we built. We are the largest full-service hardwood floor company in Northeast Wisconsin, and we keep on growing. We think that’s because of the culture we’ve created—solid work ethic, dedication to quality, and the willingness and ability to work with our customers to give them the hardwood floors of their dreams. Just like Ray and his daughter, we believe in the power of dreams, and we’ll do anything we can to make our customer’s visions become reality. We know we’re doing something right if people drive many miles out of their way to take advantage of our products and services. That also says a lot about our customers. It means they’re people who love hardwood floors enough to insist on the best, just like we do.